Outlander is about to move far, far away from the stones. But wait...is the couple we love even together during Outlander Season 3? It seems they will be at some point! We'll learn more about it when Outlander returns to Starz in September 2017. 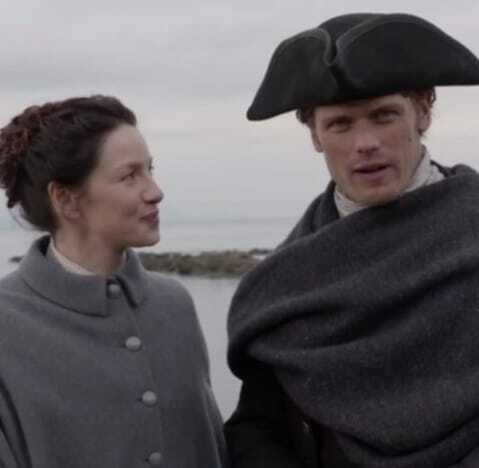 The third season will include 13 episodes based upon Voyager, the third of eight books in Diana Gabaldon’s international best-selling Outlander series. In March, production and filming on the current season moves from its home base in Scotland to Cape Town, South Africa, to shoot pivotal sea voyage scenes on the former sets of the Starz original series Black Sails. Production on the season began in September 2016 and will wrap in June 2017. Outlander will attend San Diego Comic Con again this summer, offering fans a chance to experience more of this beloved series in person. The story picks up right after Claire (Caitriona Balfe) travels through the stones to return to her life in 1948. Now pregnant with Jamie’s (Sam Heughan) child, she struggles with the fallout of her sudden reappearance and its effect on her marriage to her first husband, Frank (Tobias Menzies). Don't be hatin', but I love me some Frank!! Meanwhile, in the 18th century, Jamie suffers from the aftermath of his doomed last stand at the historic battle of Culloden, as well as the loss of Claire. Separated by continents and centuries, Claire and Jamie must find their way back to each other. As always, adversity, mystery, and adventure await them on the path to reunion. And the question remains: When they find each other, will they be the same people who parted at the standing stones, all those years ago? Our hearts say yes, yes, yes, yes!!! Carmi Zlotnik, President of Programming for Starz said “While ‘Droughtlander’ will last just a little longer, we feel it is important to allow the production the time and number of episodes needed to tell the story of the Voyager book in its entirety." Steve Kent, Senior Executive Vice President, Programming, Sony Pictures Television said, "With the scope of the production and all of the intricate details that go into the Emmy-nominated sets and costumes, we had to make sure everything is kept to the high standard of the previous seasons and Diana Gabaldon’s beautiful story." 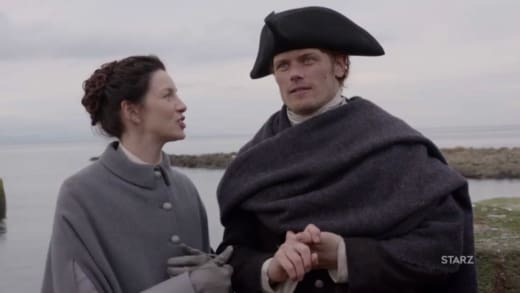 Check out the sweet and silly goodbye from our fictional dream team below, and watch Outlander online if you need to learn more about this lovely couple.